So after being a silent stalker of this forum for a few yrs I’ve finally decided to become a member. Why you ask? Back in early September I completed a ridiculously great hunt with none other than the famous BRWNBR!! After debating for yrs on which grizzly hunt and which guide to choose I went with Jake. Texting him was like talking to a buddy. The other thing that caught my attention about Jake was that he seemed VERY honest. Honest about sizes of animals, expectations of the hunt, and anything else a lower 48 guy such as myself might ask. So the hunt was booked, a grizzly sheep combo. Day 1 found myself being picked up at the Microtel in Anchorage by the master himself. After going to Jakes to rearrange gear and pack up we headed for the take off lake. After a bit of a bumpy flight due to some wind we arrived at a lake in the Talkeetna Mountains. The plane wasn’t even out of sight and old eagle eye Jefferson spots a grizz ascending the hill across the lake. Our plane apparently had interrupted his dinner plans. After a few shots out of my ’06 we trekked up a hill to make camp for the evening. Once camp was setup we had a few hours til dark so we decided to walk over to the lake we were camped on and took a few casts. We both caught some lakers. Beautiful fish out of gin clear water. I remember thinking “how in the hell did these fish get here”?!?! Some questions don’t really need answers though. With that in mind I booked this hunt with the grizzly as my primary animal. The sheep would be a mega bonus if fate would allow. At this point, evening #1, I figured if my sheep tag fell to the bottom of a lake it wouldn’t be a big loss! That mindset would change in the upcoming days. That night got down to 37 degrees. The weather was beyond amazing. NO rain, zero, nada, not even a sprinkle! Seriously Jake, expensive fancy raingear is a must?! Hmmmm could’ve lightened the load a little! I know, my next hunt with Jake will result in a monsoon! Highs were in the low to mid 60’s and lows around 40ish every night. Perfect. After a couple mile hike the 1st official morning turned up nothing. Jake decided we’d relocate a few miles up a hill and around the corner of a ridge. Along the way we spotted a few areas where a grizzly had been digging for ground squirrels. My first grizzly sign and I was jacked! Halfway to campsite #2 Jake spots a very big grizz, but at about 3 miles out walking the other way and us with 65#’s on our backs we were out of luck. We would also spot a sow with cubs. Next morning we move camp a couple miles which gives us a great view of a large valley. We spent the day glassing this long valley bordered by some mountains. We did see another sow with cubs. Beautiful blonde bear with a couple puffball cubs. Towards evening Mr. Jefferson somehow spots a sheep on a distant mountain. By distant I mean approximately 9 miles!! We could tell it was a sheep and we could tell it had something on its head in the way of horns. The plan was set, we would pack up in the morning and head off in the direction of the distant sheep. We were actually headed towards better bear country and bonus we knew there was a sheep that was a possibility. So you’re saying there’s a chance…. We spent the better part of the next day heading towards the sheep mountain. The trek included a few stream crossings a bunch of ravine crossings and as Jake would say enjoy the grind. At this point things seemed to get easier. A few days earlier I had almost written off the possibility of a sheep simply due to the enormity of the landscape. By early evening we were setup within a couple miles of where the sheep had come out the night before. We spotted a couple bull moose in the valley below, one of which was a mid 60’s giant. Looked like a couple satellite dishes sticking up out of the willows. At the base of the sheep mountain I manage to spot a gorgeous bear. However, once again its to far away and in some very unforgiving terrain. We also see yet another sow with cubs. Next up our sheep makes his appearance. He comes around the face of the mountain and goes to directly to a cut and proceeds to eat right up until dark. We could see he was broomed on one side and the other side appeared to be pretty impressive. Keep in mind this was the first dall ram I’d ever seen. I am by no means a sheep guy but this sheep looked quite large to me. Jake was in the 90%ish range on if the ram was legal. After a quick breakfast of oatmeal and coffee we were off. 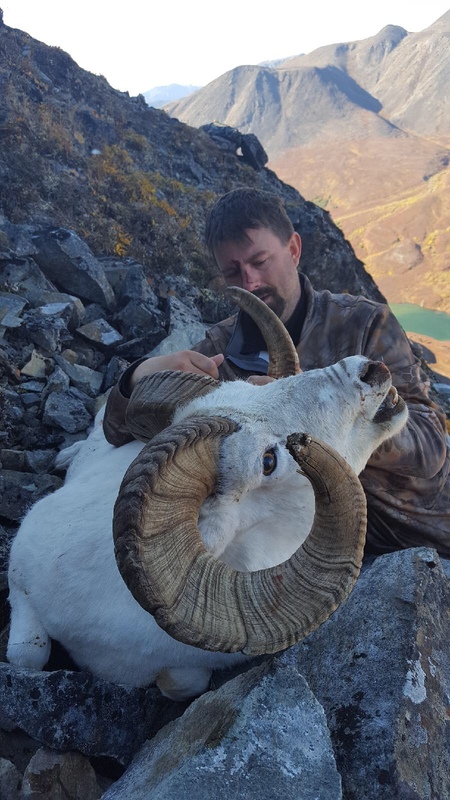 The ram was still on the face of the mountain just a bit higher up towards the ridgeline. Midway through our stalk the ram topped out over the mountain. Our hope was that the ram would be bedded just over the top in a spot we could reach. On the way up I kept hearing my 11 year old son Logan’s voice in my head saying “50 more yards dad!” He was my “personal trainer” back home in Wisconsin as we’d hike up the local ski hill. As we neared the top Jake informs me that not only does the sheep have to be legal but we have to be able to recover it. This alone takes it up another level. As we round the ridge Jake freezes and points upward. There bedded down on a ledge at 400 yards was the most awesome sheep I’ve ever seen. The sight of him bedded there perfectly relaxed overlooking the vast wilds below him will be forever burned in my memory. We proceed to back up and ascend the ridge to cut the distance in half. At 207 yards Jake determines the ram to be at least 10 years old and we’d be able to recover him if I can manage to do my job. In a prone position the moment is finally here. Shot #1 misses and the scope drills me in the forehead. Ram still bedded, clueless, shot #2 misses and once again my forehead takes the scope squarely. Now the ram has gotten to its feet as it has figured out something isn’t quite right. Shot #3, yep another miss and another slam to the forehead, however, a small miracle takes place. I see the 3rd shot hit some rocks beyond the sheep, aha, I’m hitting high. With the last bullet in the chamber I compensate and aim low. Jake says “you hit him!” Turns out it was right thru the boilerhouse. I watch as the ram takes a jump down and the last thing I see is all four feet skyward as he tumbles out of sight. Beyond ecstatic would be an extreme understatement of how I felt at that moment. I don’t think it’s possible to describe feelings of a moment such as this, a moment that started 3 years prior and culminates with an 11 year old ram that has 13” plus bases! 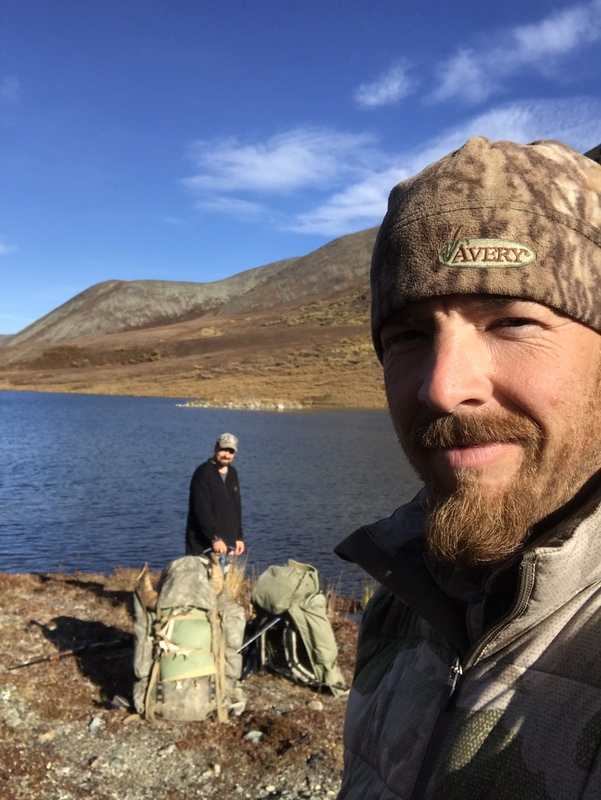 After taking pictures, caping out the ram, and stuffing our packs with meat Jake says “It’s time to show you how to self arrest.” Huh?? Self arrest?? He trades me one of his walking axes for one of my trekking poles and tells me that if I begin to fall to bury the axe head into the side of the mountain. This should help slow me down?!?! With full packs we made our way step by arduious step up and over the mountain. Yes up, it was much safer than the alternative. Once we got back to the bottom Jake recommended that I shoot my gun. Turns out it was almost 18” high! Only thing I can think of is that the scope got knocked off during our travels with my gun hanging on the pack. Thank God for seeing the 3rd shot hit the rocks beyond the sheep. Once back at camp we dined like kings. Sheep loin in its own fat in a jetboil, with some bbq dry rub seasoning. Adventure complete!! Oh wait, this is a grizzly hunt! After a restful nights sleep we packed up camp to move 5 miles to a pickup lake. 98#’s of meat and camp never felt so good. Halfway to our new camp we spot a string of caribou swimming across the lake we’re going to camp on. Once camp is set up and with a belly full of mountain house (BTW sweet and sour pork and beef stroganoff get my vote) we take some casts in the lake that we’re on. Jake manages to catch a grayling. Wore out and about ready to tuck in for the evening Jake says “I see a grizz”. I honestly thought he was joking around. Through his magical spotting scope he spots a beautiful grizzly a little over a mile out in fading daylight. It appears to be pre occupied on the side of a hill digging for ground squirrels. Jake says he isn’t sure, with the fading light and distance it might be a long shot. After some short hesitation we’re off. Within a couple hundred yards I’m sweating like Shaq at the foul line! Under normal circumstances we wouldn’t have to rush but we were racing against the departing sun. Every once in a while Jake would check on our bear, yep it’s still there, and off we’d go. At about 200 yards it decides to walk down the hill. The bear is now in a dip where its’s hidden from sight. We take off at a fast pace right at the rise in front of us. Suddenly Jake grabs my arm and tells me to get down it’s coming right at us. From a seated position all I can see is the tips of its ears and the big brown shoulder hump. As it lumbers in our direction I feel my heart about ready to jump out of my chest. At 40 yds it stops, again all I can see is the tips of its ears and the big hump of the shoulders, then IT happens. The grizzly STANDS UP!!! Yes fully upright, standing facing us at 40 yards! One shot to the chest and it’s off and running. After about 50 yards and 1 more errant shot the grizz rolls over and expires. Jubilation! A dream realized! Just when you think the day is over Jake looks in that dang spotting scope. That night we walked back to camp with the aid of our headlamps. Once back we crawled in the tent and even enjoyed a few tunes by Metallica and Disturbed. Great guide and Jake even has good taste in music! In the morning we returned to the bear for some pictures and skinning. Beautiful bear, dark legs, silvery blonde back, phenomenal hunt. Not a huge bear, but my bear, a gorgeous 6’ish range. At close range standing up after a mad dash across some goofy terrain in my mind it couldn't have been any better. 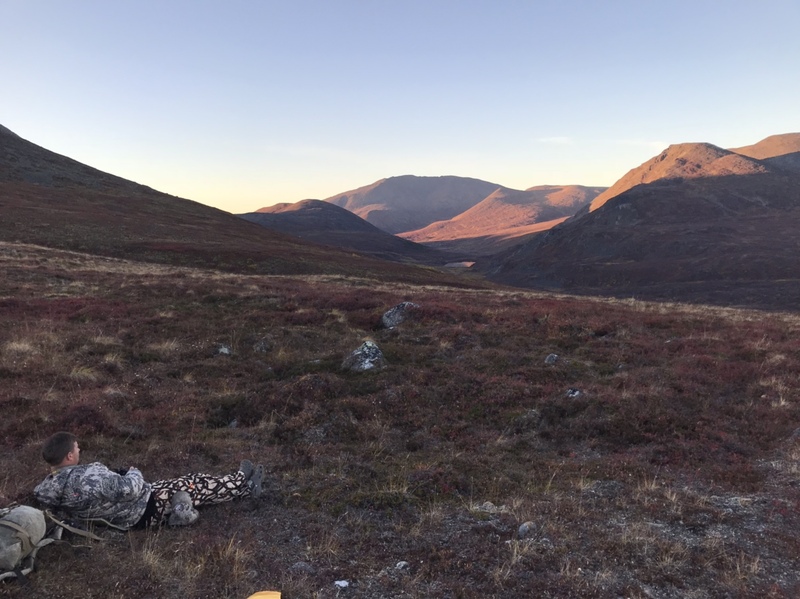 In all we saw 22 sheep, 15 grizzly, about a dozen moose, a whole lotta caribou, rock ptarmigan, willow ptarmigan, lake trout, a grayling, and I’m sure I’m missing a few other critters. My two cents on gear are as follows: I wouldn’t even consider hunting sheep without trekking poles. Gaiters are a must for the creek crossings. If you’re wondering both animals were taken with 180 grain barnes triple shock bullets out of a Savage 30-06...with a wood stock! Thanks to those on this forum that unknowingly gave tips on gear etc. Lastly a special thanks to Mr. Jake Jefferson. By now I’m sure we’re all aware of the tragedy that happened to Jake and his family with the passing of his wife Amber. Buddy if you’re reading this their has been many prayers sent your way. My hopes of doing a write up of our hunt is to make you smile for a few moments thinking back to 6 pretty awesome days. Thanks again for helping a guy from the flat lands of central Wisconsin realize his dreams. Awesome write up! Felt like I was there w y’all! Congrats on the hunt and future ones w your son!! Thanks for the memories. Hard to not read this stuff and tear up a bit these days. I only thought life was complicated then. Amazing how fast things can change. I loved that hunt not just for the success but for the attitude you had and being able to share alaska with a hunting buddy like you. Great story, great hunter and great guide. Thanks for sharing, plus a very good write up. Great write up! Someday I’d love to do a similar hunt! Sounded like a great hunt and congratulations. Seeing that vast country is half the hunt. Jake is top notch from start to finish on his hunts. Wouldn't have chose anyone else for my sons hunt. I know he will be back guiding it's what he loves do. Great write up for sure. Pray some day soon Jakes kids will be guiding with him and back in the field again. I know he will be back guiding it's what he loves do. Unfortunately, doing what you love, and doing what you can, are two entirely different things......as all too many know. I do hope he can make it back. Congratulations and thanks for posting. You just took me back to when I was with Jake hunting my grizzly. Great write-up! Congratulations on the nice ram and beautiful bear. 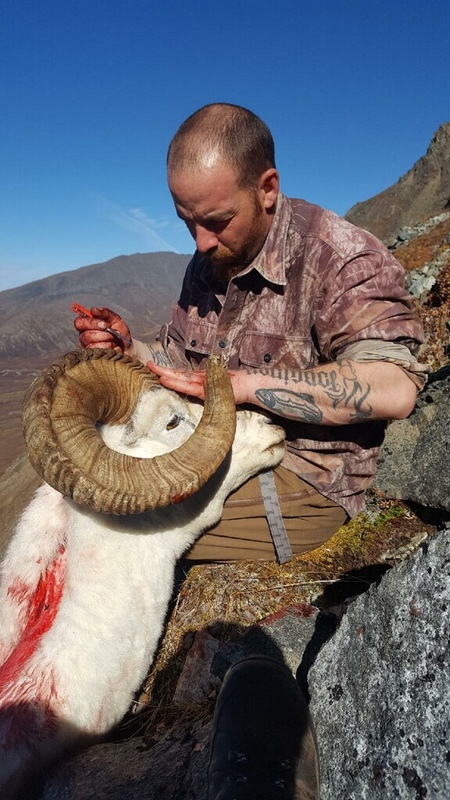 One of those rare Alaskan hunts where the planets all line up and everything goes right(weather,animals, hitting the ram even with you’re scope being off) Awesome!! !